Muskegon, Michigan, USA...Steel bearings can have significantly shorter lifetimes when subjected to harsh environments such as those found in semiconductor manufacturing. Hybrid bearings—which combine ceramic rolling elements with stainless steel races—provide a longer-life, corrosion-resistant alternative. 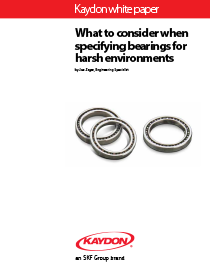 In a new white paper, Kaydon engineer Joe Zagar describes the contamination challenges and bearing lubricant considerations involved when specifying and using bearings in harsh environments, and how hybrid bearings can meet those challenges.